Learn more about how helicopters can benefit your agricultural operation in Oklahoma. A helicopter provides many aerial application opportunities to assist farmers in Oklahoma. FairLifts partners with pilots who can perform a variety of aerial application services including countering frost, eliminating weeds and brush, and eliminating mosquitoes as well as other pests. A helicopter will decrease your manual labor when performing aerial application throughout the state of Oklahoma. Oklahoma has many farms, ranking the fourth overall in the United States. The state holds 78,000 farms stretching 34.2 million acres. Each of these farms averages 438 acres. In 2013, Oklahoma exported over $1.3 billion in agriculture. Oklahoma ranks number one in the production of rye in the entire nation and number four in the production of pecans. Key crops in the state of Oklahoma include rye, pecans, and soybeans. Agriculture products from Oklahoma stretch beyond the United States; two major importers include Japan and Asia-Pacific countries. From crop surveys to dry and wet spraying, FairLifts can offer you more options for aerial application in Oklahoma. By using helicopters for your crop needs, you are choosing a more accurate, even coverage for your fields. Helicopters are much faster, have less of an impact on surrounding crops or roads, and provide more penetration of the crop canopy. With so many benefits as well as saving you time, gaining you profit and assisting in production of higher quality products, there is very little else to decide other than when you’d like for the pilot to come to your farm. Take a look at the options below, while these are the most popular we offer customized scheduling for specialized needs as well. FairLifts wants to help all of your crop-dusting needs. Options include fertilizing, using fungicides, spraying seeds, or simply watering. Each of these services is customizable and will be applied by a skilled pilot to help the quality and the yield of your crops. No job is too big or small for FairLifts. As any farmer knows, mosquitoes and pests can destroy crops, hurting your overall crop yield. Aerial application set up by FairLifts will assist you on getting rid of pests so your crops can flourish. A helicopter can spray for pests faster than any ground method could. FairLifts wants to use aerial application to help you eliminate brush and weed problems you may be having. A helicopter can spray for weeds, which will end up saving you lots of manpower, time, and effort. 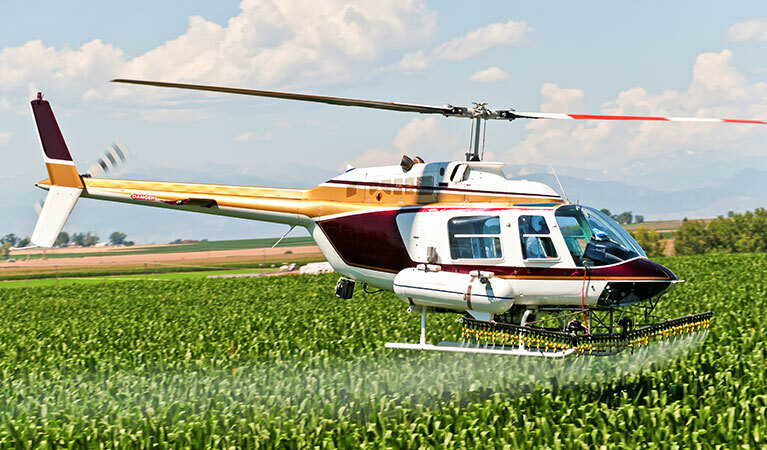 FairLifts arranges a helicopter service to help you get rid of weeds right away to help with the quality of your crops. A silent killer of crops can be frost. Sometimes the temperature drops at night and damages crops. Helicopters can help with frost damage by spraying. A helicopter can spray to either combat damage you have suffered from frost or spray or be used as a preventative method. Experts are standing by to get you a fast quote for your agricultural job in Oklahoma! FairLifts only arranges the best aerial agricultural services. Call us for your crop-dusting needs and increase the yield and quality of your crops in Oklahoma. Team members are waiting for your call and can answer any questions you may have. We are available 24/7.